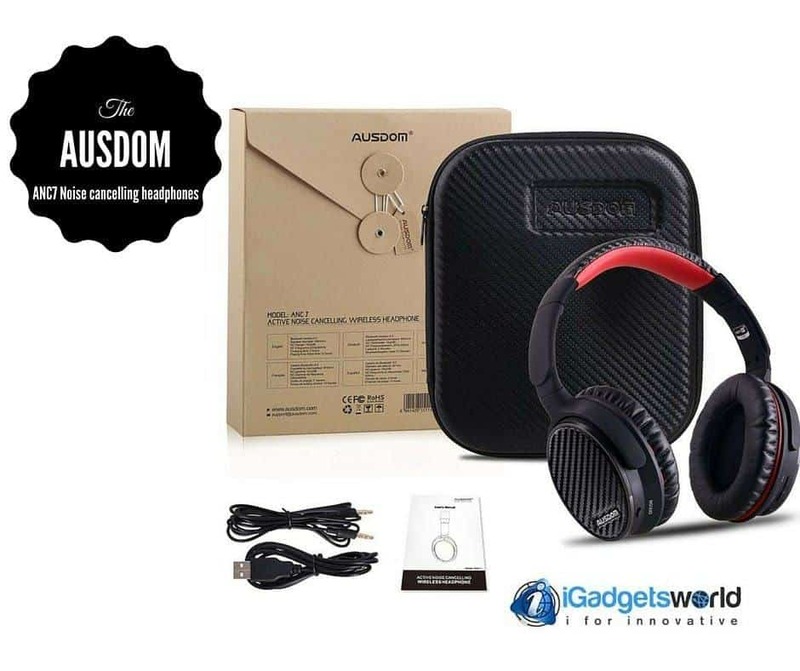 Ausdom is famous for their innovative product development in audio section and the latest Ausdom ANC7 Bluetooth headphone is not an exception to their innovation, as it comes with active noise cancellation feature. The company re-designed these headphones with a major focus on noise cancellation and it has given the best performance out of noise cancellation headphone. Before writing the in-depth review on Ausdom ANC7, let’s have a look at what is Noise cancellation and how it works. When it comes to noise canceling headphones, there are two types: PNC (passive noise cancellation) and ANC (active noise cancellation). Passive noise cancellation (PNC): It is not a high-end technology and it creates the noise cancellation via dampening effect through the foam padding, built in the headphones. The effectiveness of noise cancellation completely depends on the density of the foam padding. Active noise cancellation (ANC): It is a high technology that involves a pretty interesting process to cancel out the sound. Along with the padding that passively blocks a little bit of sound, microphones planted in the ear wells create a sound wave that zaps out the rest of the ambient noise level. The goal is to hear nothing but the music and take you into the trance of music and Ausdom ANC7 works on the same principle of noise cancellation. Ausdom ANC7 are the best headphones with rich noise canceling feature, fast connectivity, and top class battery back-up. If you believe that best products only comes at an expensive price, then you are wrong. Ausdom has done its best in offering the product with all top class performance at an affordable price of less than $100 which itself is a deal. Now let us start the review. ANC7 is designed in lightweight Carbon-fiber that is blended with custom fit supra-aural soft earmuffs. The earmuffs are elegantly coated with artificial protein leather. The artificial protein leather is designed to simulate human skin texture, which helps in providing comfort for a longer duration. Along with great design, it has an inline remote and microphone to add more convenience. The inline remote helps in taking the hands-free calls and resume your music with no obstruct. For safe storing of the headphones, you can safely store in the slim, ultra-protective carrying case. Ausdom has tried its best to give the best performance in its latest version of ANC7. I found the active noise-cancellation to be extremely effective in zapping out ambient noises and it kept me distraction-free for longer than I knew was possible. It’s possible to use the noise-cancellation feature for up to 25 hours per battery charge, but I was able to squeeze more time out of mine. The sound engineered in the Ausdom ANC7 is outstanding. I tried hearing all kinds of music: the lows, mids and highs and in a combination with each other. ANC7 could render it so clearly without stepping over each other. Music of all types of genres is predictably incredible. With the noise-cancellation, I would call it as virtual reality for your ears. I would call it as virtual reality for your ears. I was immersed and concentrated in the music with the noise cancellation “ON”. I played some games on my PC and the results were fabulous and memorable. With noise-cancellation off, these headphones still tried to deliver respectable sound with all of the highlights I mentioned earlier. There are times when noise-cancellation makes me a little too focused and once I switch it off, I feel like I stepped out of cryo-sleep, so it’s great to have the option to listen to music with noise cancellation switched off sometimes. Ausdom ANC7 can be used both wired via 3.5 mm audio cable and premium Apt-X Bluetooth 4.0 wireless connectivity. The advanced Bluetooth technology helps in streaming the music very fast to your headphones from your PC, smartphone, tablet & more with over a 33-Foot wireless range. When it comes to battery, it has a built-in 400mAh rechargeable lithium-ion battery, that charges in a rapid 2 hours and it provides for up to 18 hours of continuous music playback or up to 18 hours of continuous talk-time on a single charge. An additional audio cable cord is also included so you can connect the headphones manually. ANC7 is an affordable cohesive unit that has all the embedded technologies making it a unique headphone from Ausdom. It has all features that can balance design, features, and sound profile delicately, and excels at it all. The other part which I liked is its cost. Priced at $80, it’s a fantastic deal based on its stunning build quality, feature set, and vibrant sound. 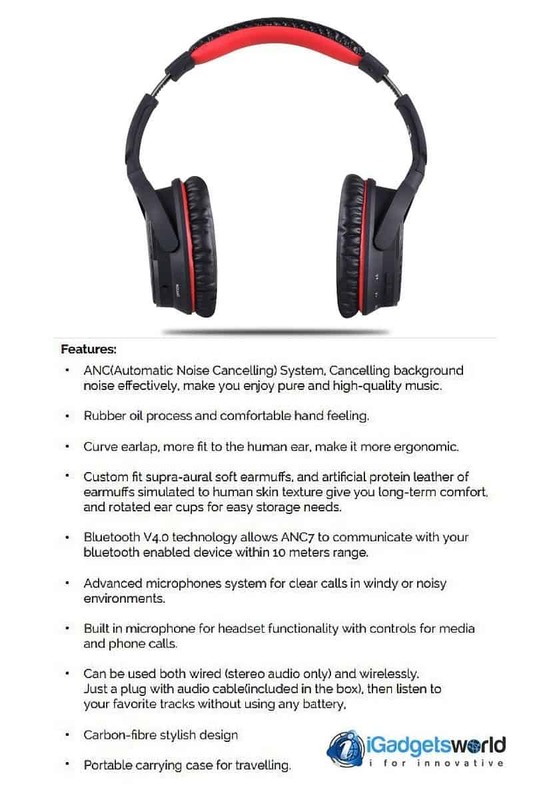 You’re getting a finely-tuned set of headphones that provide over 25 hours of very good noise-cancelling performance with a single charge is astonishing. It lacks in giving the best bass. Also, it would be great if it comes with few color options and less bulky size & supports NFC. The Ausdom ANC7 bring out nothing but the best in music & it is a marvelous piece of technology. Not only it delivers a mind-blowing music every time when you use it, but also the ANC will make you to stick to it. 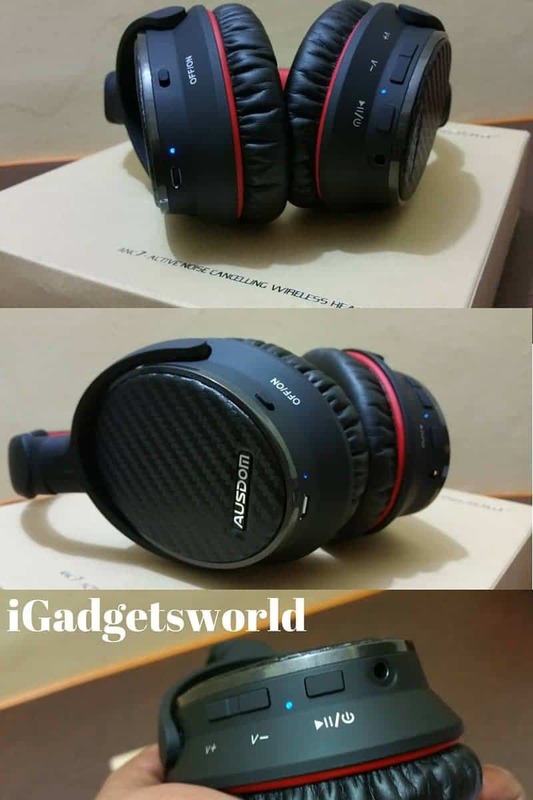 If you’re serious about the sound output and want to hear your favorite music and games in a new way, & if you just want the best set of noise-cancelling headphones and that too everything below the price range of $100, then Ausdom ANC7 is for you. 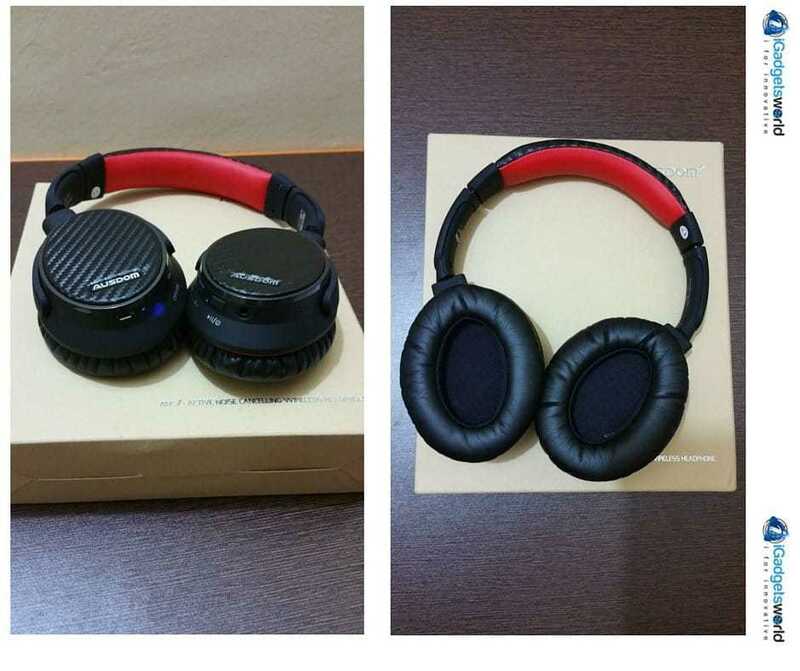 If you're serious about the sound output and want to hear your favorite music and games in a new way, & if you just want the best set of noise-cancelling headphones and that too everything below the price range of $100, then Ausdom ANC7 is for you.